Scientists have for the first time recorded individual brain cells in the act of summoning a spontaneous memory, revealing not only where a remembered experience is registered but also, in part, how the brain is able to recreate it. The recordings, taken from the brains of epilepsy patients being prepared for surgery, demonstrate that these spontaneous memories reside in some of the same neurons that fired most furiously when the recalled event had been experienced. Researchers had long theorized as much but until now had only indirect evidence. Experts said the study had all but closed the case: For the brain, remembering is a lot like doing (at least in the short term, as the research says nothing about more distant memories). The experiment, being reported Friday in the journal Science, is likely to open a new avenue in the investigation of Alzheimer’s disease and other forms of dementia, some experts said, as well as help explain how some memories seemingly come out of nowhere. The researchers were even able to identify specific memories in subjects a second or two before the people themselves reported having them. “This is what I would call a foundational finding,” said Michael J. Kahana, a professor of psychology at the University of Pennsylvania, who was not involved in the research. “I cannot think of any recent study that’s comparable. “It’s a really central piece of the memory puzzle and an important step in helping us fill in the detail of what exactly is happening when the brain performs this mental time travel” of summoning past experiences. The new study moved beyond most previous memory research in that it focused not on recognition or recollection of specific symbols but on free recall — whatever popped into people’s heads when, in this case, they were asked to remember short film clips they had just seen. This ability to richly reconstitute past experience often quickly deteriorates in people with Alzheimer’s and other forms of dementia, and it is fundamental to so-called episodic memory — the catalog of vignettes that together form our remembered past. In the study, a team of American and Israeli researchers threaded tiny electrodes into the brains of 13 people with severe epilepsy. The electrode implants are standard procedure in such cases, allowing doctors to pinpoint the location of the mini-storms of brain activity that cause epileptic seizures. The patients watched a series of 5- to 10-second film clips, some from popular television shows like “Seinfeld” and others depicting animals or landmarks like the Eiffel Tower. The researchers recorded the firing activity of about 100 neurons per person; the recorded neurons were concentrated in and around the hippocampus, a sliver of tissue deep in the brain known to be critical to forming memories. In each person, the researchers identified single cells that became highly active during some videos and quiet during others. More than half the recorded cells hummed with activity in response to at least one film clip; many of them also responded weakly to others. 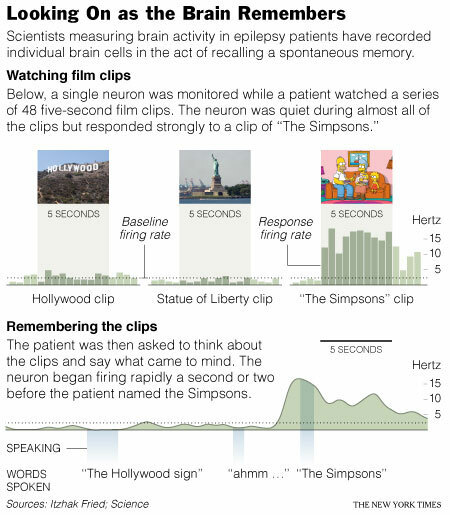 After briefly distracting the patients, the researchers then asked them to think about the clips for a minute and to report “what comes to mind.” The patients remembered almost all of the clips. And when they recalled a specific one — say, a clip of Homer Simpson — the same cells that had been active during the Homer clip reignited. In fact, the cells became active a second or two before people were conscious of the memory, which signaled to researchers the memory to come. “It’s astounding to see this in a single trial; the phenomenon is strong, and we were listening in the right place,” said the senior author, Dr. Itzhak Fried, a professor of neurosurgery at the University of California, Los Angeles, and Tel Aviv University. His co-authors were Hagar Gelbard-Sagiv, Michal Harel and Rafael Malach of the Weizmann Institute of Science in Israel, and Roy Mukamel, of U.C.L.A. Dr. Fried said in a phone interview that the single neurons recorded firing most furiously during the film clips were not acting on their own; they were, like all such cells, part of a circuit responding to the videos, including thousands, perhaps millions, of other cells. In studies of rodents, including a paper that will also appear Friday in the journal Science, neuroscientists have shown that special cells in the hippocampus are sensitive to location, activating when the animal passes a certain spot in a maze. The firing pattern of these cells forms the animals’ spatial memory and can predict which way the animal will turn, even if it makes a wrong move. Some scientists argue that as humans evolved, these same cells adapted to register a longer list of elements — including possibly sounds, smells, time of day and chronology — when an experience occurred in relation to others.